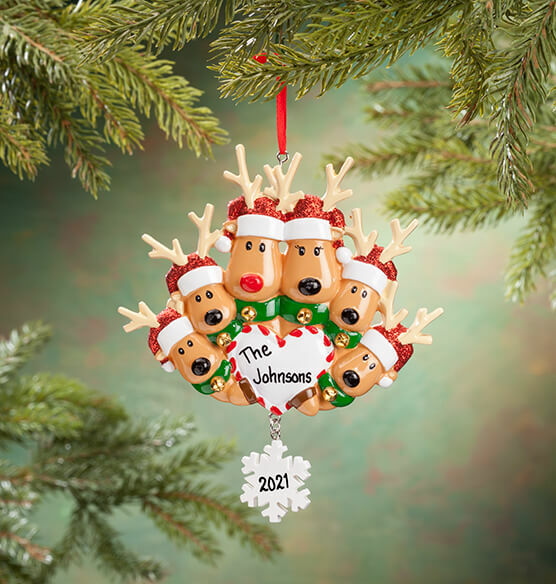 Deck your tree with something DEER ... like this cute Personalized Reindeer Family Ornament, donning one name and year! 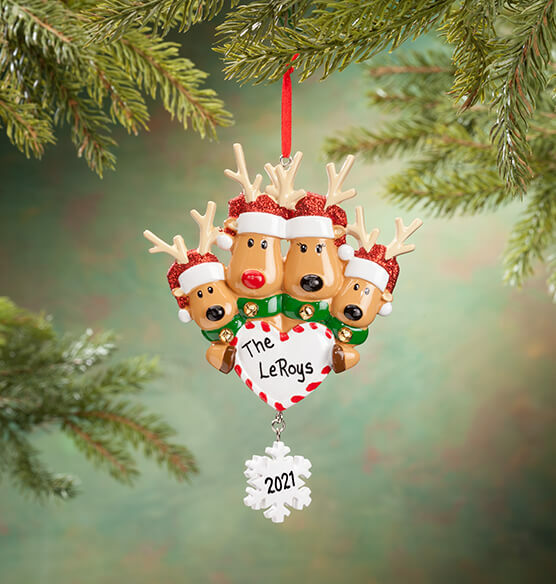 Adorably detailed with sparkling red Santa caps and real jingle bells, each reindeer family features one special member with a red Rudolph nose. 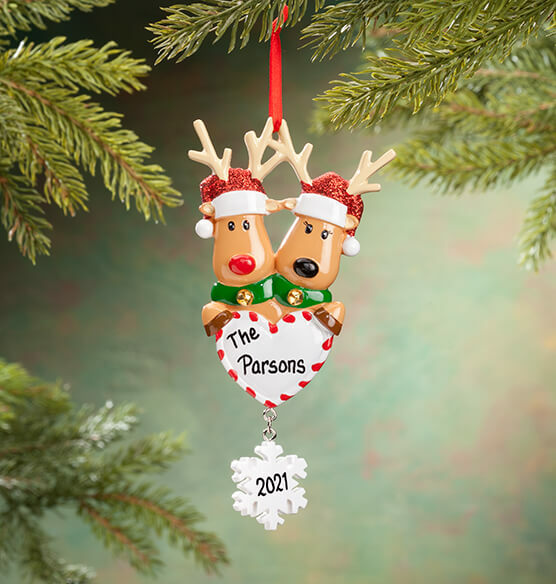 Choose a family of 2, 3, 4, 5 or 6 reindeer, and we'll personalize with your family name and year, creating a custom treasure to give or keep. 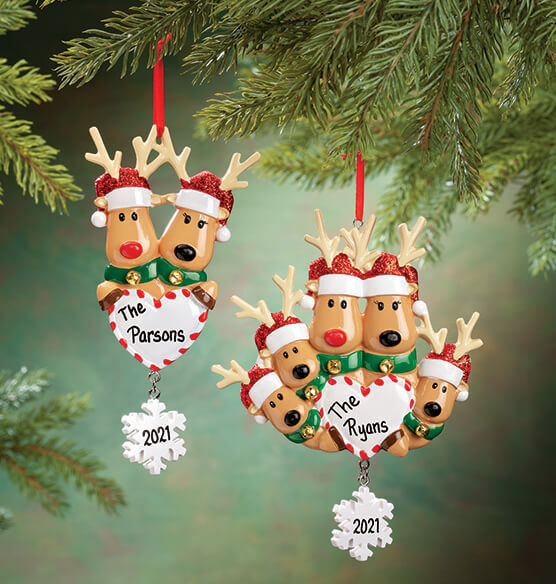 Specify names for reindeer: limit 1 line, up to 8 letters/spaces each. Specify family name; limit 1 line, 15 letters/spaces. Specify year; limit 4 characters. Resin. Personalized Family of 2 , Personalized Family of 3 , Personalized Family of 5 , Personalized Family of 6 , Plain Family of 2 , Plain Family of 3 , Plain Family of 5 , Plain Family of 6 are not available at this time. We give our son's family a personalized ornament every year at Thanksgiving so they can put it on their Christmas tree for the year. I love giving personalized gifts and this fits the bill!! 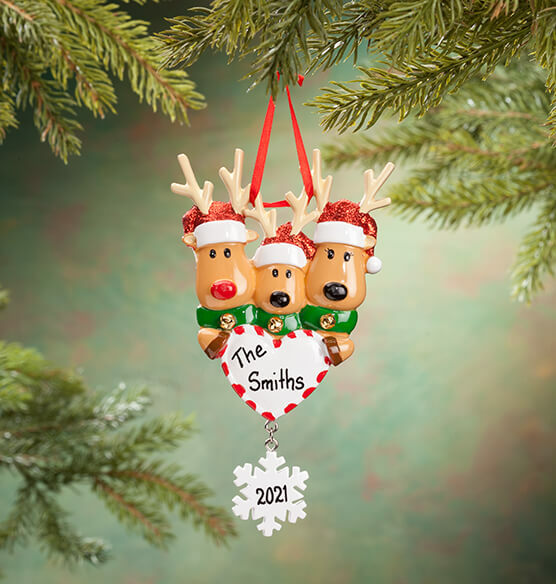 This is a very attractive ornament, plus the price was good with the free shipping and the discount. My bad,I did not think and did not list the names correctly so have to reorder these next Fall when they are back in stock. Not MK fault, but mine. To late to send it back to get it done right in time for Christmas, dissapointed. The ornament is cute, nice size. Bummed they misspelled my grandson's name on it. My husband and son hunt, so the deer was more meaningful. I like it, thought it was cute. names come on the hats? BEST ANSWER: Thank you for your question. Unfortunately not there is not enough room on the hats for the names. We hope this information will be of help to you.